Risk Management for Fitness Facilities - ABEX Affiliated Brokers Exchange Inc. Fitness facilities are popular destinations for those looking to get in shape, and the owners and operators of these facilities are passionate about helping their members better their health. However, to best serve their members, owners of fitness centres need to address the unique risks associated with their business. This Risk Insights reviews some of the most common risks associated with fitness facilities and provides ways business owners can limit their exposures. While group fitness classes and boot camps are popular, they can put participants at risk. When offering such classes, remind those participating that they should only sign up for programs that suit their level of fitness. For further protection, you can ask patrons to sign a waiver and release form. Offering beginner and intermediate programs in addition to high-intensity classes is another great way to ensure a participant’s skill level is paired with the correct workout. Additionally, you should empower all instructors to move participants out of a class and into another, more skill-appropriate class, if necessary. Because patrons of your facility are running, jumping and using heavy equipment in crowded workout areas, they are at risk of tripping and falling. Installing non-slip floor materials where appropriate can greatly reduce the likelihood of a fall. Rubber floors, mats and gym turf are reliable flooring options that also act as a shock absorbent, protecting the floor from damage caused by weightlifting and other activities. The type of flooring that’s right for various workout areas depends on the activities being performed. Be sure to conduct thorough research prior to any major purchase. Staff should also avoid mopping heavily trafficked floors during peak hours, as this can create a slipping hazard. However, employees should address any spilled substances immediately to eliminate the potential for an accident. To further protect patrons from slips and falls, it’s important to practise good housekeeping by removing objects like weights, electrical cords and exercise balls from common walkways. In addition, you should instruct members to always return equipment to its appropriate storage location when they are done using it. Regardless of how an injury occurs, it’s important that you log any incidents that occur at your fitness facility. You can use signage to educate fitness facility members on the rules of the gym, common hazards to watch for and ways to avoid injury. While most trainers you hire may be exemplary employees, they can be a source of serious liability. For example, a trainer could encourage a patron to exercise above their ability during a workout, causing serious physical or emotional trauma. In addition, because trainers work closely with their clients, the risk of sexual and other types of harassment increases in fitness facilities. To combat this, it’s important to screen your personal trainers heavily during the hiring process. You will want to examine a trainer’s demeanour and professional qualifications closely during interviews. Exercise equipment and weights, if used improperly or without a spotter, can cause broken bones, sprains and other types of injuries. What’s more, equipment can break if it is misused or abused, leading to costly repairs and a reduction in the quality of your members’ experience when their favourite equipment is unusable. Inspect all of your machines regularly for loose or frayed cables and other damage. Machines may be used by hundreds of members each day, so they can deteriorate and malfunction quickly. Train your staff on how and when to decommission machines that are not in perfect working order. A “do not use” tag should be attached to equipment that is out of service. Make sure treadmills are strategically placed to reduce the possibility of a gym member stumbling and being thrown into a wall. Pad any walls behind treadmills that cannot be repositioned. Train all club members on the proper use of equipment. Monitor the workout areas, and intervene if risky behaviour is observed. Purchase quality equipment from a reputable dealer who is able to offer parts and service. Keep a repair kit on hand in your gym. Lubricate the pedals of exercise bicycles, elliptical machines and cross trainers regularly. Avoid installing equipment that can be especially hazardous. 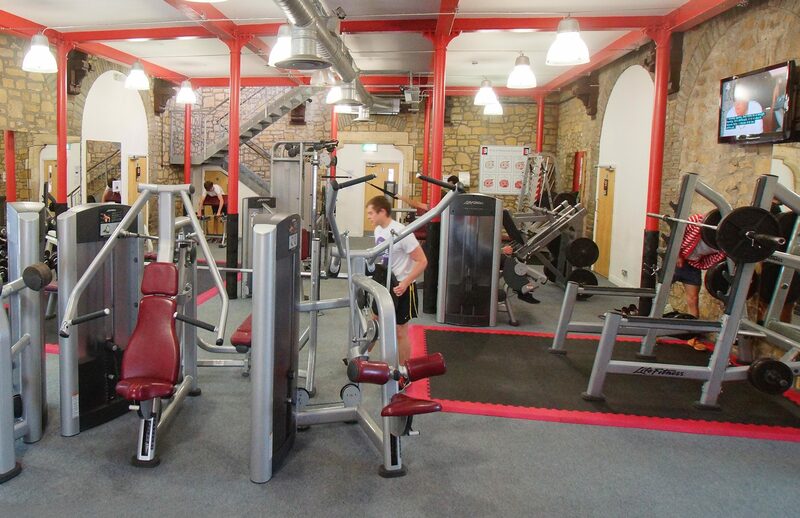 This can include cable pull-downs, seated crunch machines, machine abductors and abdominal rotation machines. Instruct patrons to wipe down communal equipment before and after they use it. This will keep bacteria from breeding on shared equipment like cardio machines, weights and yoga mats. Your staff should also perform thorough cleanings of all machines and equipment on a regular schedule. Because locker rooms are designed for privacy, the likelihood of an assault or other emergency can be high. Regardless of the calibre of your clientele, these incidents can happen without warning. As such, it’s important to make sure a staff member is present or conducts checks of the locker room in regular intervals. You will also want to consider the personal property of your fitness facility members. Above all, it’s important for your locker room to have properly maintained and functioning lockers. You can also control access to lockers and locker rooms by using a key system that requires members to check in at the front desk. This can not only help control instances of theft, but also allow for strict monitoring. In addition to the risk of theft in locker rooms, there is also the risk of injury, as many locker rooms also feature shower facilities. Whenever water is present, there’s a chance gym patrons could slip and fall. Ensure that your shower area is equipped with adequate drainage, particularly in walkways between showers and doorways. The staff member assigned to monitor the locker room should also keep an eye out for soap spillage or other liquids that could make walkways slick. Locker rooms can also be breeding grounds for germs and bacteria that cause athlete’s foot, warts and brittle nails. As such, patrons should be instructed to wear flip-flops or other footwear in the shower, pool and locker room areas. Depending on the complexity of your fitness facility, you may provide pool access to your patrons. Similar to shower facilities, pool decks create slip and fall risks, which, in turn, create liability exposures. To limit the risk, it’s important to ensure that the general walkways of the pool deck are free of hoses, mats and other slipping and tripping hazards. In addition, swimming itself creates its own set of risks. For instance, patrons could drown or get injured on the diving board. What’s more, many types of bacteria can survive easily in swimming pools, circulating among different swimmers to spread illnesses. Post appropriate signage in and around the pool area. The signs should detail the rules of the pool and the general risks associated with using your facilities. Ensure that lifeguards and personnel are present, properly trained and alert. Keep lifesaving equipment close to the pool at all times. Be aware of the pool depth and enforce “no diving” restrictions in shallow areas. Keep the pool water properly filtered and chemically treated at all times. Never store ungrounded electrical equipment near the pool. Only use only ground circuit fault interrupter (GCFI) outlets in the pool area. Keep patrons out of the pool during lightning storms. The risks of running a fitness facility are not simply limited to liability issues. Like any business, fitness facilities could be the victims of cyber attacks, natural disasters or other emergencies. Cyber risks. Small businesses are often easier to hack, which means that your customers’ data—their names, addresses and credit card information—could be a target for cyber criminals. As more and more fitness facilities move to online solutions for enrollment and class scheduling, proper cyber-security measures are becoming vital. Catastrophic events like wildfires, floods, earthquakes and wind storms can strike without warning. When they do, businesses could face costly, sometimes debilitating, damage. Emergencies like explosions, violent acts, shootings, sexual abuse and disease outbreaks can impact fitness facilities at any time. The cost to recover from these incidents and repair your reputation is often significant—sometimes hundreds of thousands of dollars. The risks a fitness facility faces are many, and organizations that fail to mitigate their exposures may find themselves in expensive legal trouble. Because the type and severity of risks is largely dependent on a fitness facility’s specific features, it’s important to speak with a broker about coverage options. He or she will be able to analyze your exposures and determine the coverage that is right for your business. This entry was posted in Business and tagged fitness facilities. Bookmark the permalink.